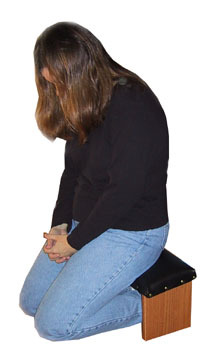 You assume a kneeling position, then sit back on the stool-like bench, which takes almost your entire body-weight off of your knees while allowing you to remain in a kneeling, prayerful posture. Your feet are tucked under the bench. About 9" tall for comfort and convenience. Tucks neatly under bed or into a closet when not in use. Please select from the following options to complete your Taizé-style Prayer Bench. All figures are estimates based on our latest materials, labor and freight expenses. It is unusual for us to have to change any costs except in the case of special shipping or design needs. 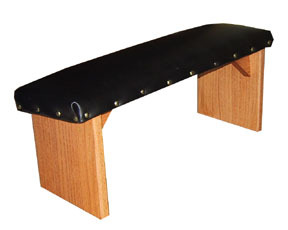 Top Pad: Our kneeler tops are made from solid 1x8 hardwoods. The edges are rounded for comfort. We can also affix a pad if you wish. We use heavy duty, textured vinyl due to its appearance, strength and ease of cleaning. Without the pad, the wood's beauty really shows through. If you have a different material you'd prefer, you are free to send it to us prior to assembly. Engraving: We can engrave a brief commemorative message onto a silver- or gold-colored metal plaque. There are two engraving lines available, each with up to about 20 characters, including spaces. On this model the engraved plate is epoxied under the seat.